To begin this great Dry Creek Valley wine trail, take the Dry Creek Road exit from Highway 101 and continue West on Dry Creek Road. There are several wonderful wineries to visit on Dry Creek Road and making a choice of which ones to visit is not easy. We have visited all the wineries along this stretch and these are our favorites. Be sure to pack a picnic lunch to enjoy in the vineyards. Our favorite picnic winery on this wine trail is Dry Creek Vineyards. It is almost directly across from the historic Dry Creek General Store. You can pick up a fantastic lunch at this historic stop on Dry Creek. 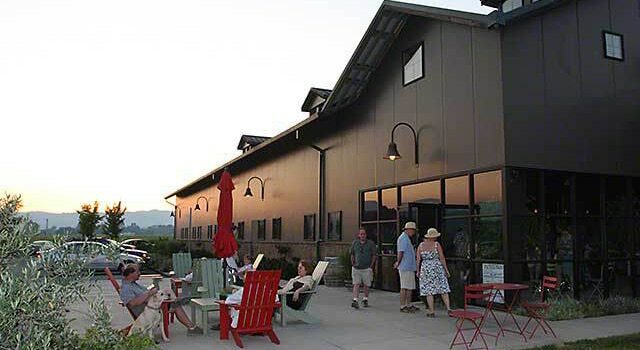 We recommend you take two days to explore wineries in the Dry Creek Valley. visit wineries on West Dry Creek Road. We recommend that you visit no more than three wineries in one day. Pace yourself and enjoy the serenity of Dry Creek Valley. Mauritson is four miles west of the Highway 101 Dry Creek Exit . It’s the big olive green winery building at the corner of Dry Creek Road and Lytton Springs Road. For over a 100 years the Mauritson family has been tending to the vineyards in the Dry Creek Valley. In the late 1990’s they began producing wine from their finest vineyards. Clay and Carrie Mauritson are the owners and Clay is the winemaker. The Sauvignon Blanc is terrific and our favorite of the delicious Dry Creek Sauvignon Blancs. The winery produces some lush reds from their Rockpile Vineyards. These are made in small amounts and sell out quickly. The tasting room is open daily 10-5. The Dry Creek Vineyard winery is one of the first wineries in the Dry Creek area to open its doors to visitors. In 1972, David Stare founded the winery with the goal of making Sauvignon Blanc in the French tradition. Today his daughter Kim Stare runs the winery. The winery offers what we call consumer-friendly prices, with several wines offered under the $20 price range. These wines are excellent values. Dry Creek Vineyard has different tasting and tour options for visitors. They also have one of the best picnic areas around. Grab your lunch at the historic General Store on the corner of Lambert Bridge Road and Dry Creek Road and then head to Dry Creek Vineyard. A favorite wine of ours for a picnic lunch is the Chenin Blanc offered by Dry Creek Vineyard. Delightful! Truett Hurst partners purchased the Martin Family Winery. Paul Dolan, a former Fetzer exec and one of the pioneers of organic and biodynamic vineyard farming is one of the prinicple partners. The winery is currently undergoing several changes but is open to visitors. This is a first-class organization and the first vintages of wine are measuring up to the hype. Truett Hurst is about 3 miles west of Mauritson. Yoakim Bridge Winery is a very small winery run by David Cooper and Virginia Morgan. The wines are big, full bodied, and well structured, full of amazing flavors. The wines are estate, and all sourced from the Dry Creek Valley. If you like big wines, don’t miss this winery. You will find the Yoakim Bridge Winery at the corner of Dry Creek Road and Yoakim Bridge Road. From Yoakim Bridge continue along Dry Creek Road for about one mile. Watch for the signs to Dutcher Crossing Winery and turn right into the driveway. This winery is a recent addition to Dry Creek Road and boasts one of the most beautiful tasting rooms in any wine country. The picnic area provides some very fantastic vineyard views of the Dry Creek Valley. The Chardonnays are delicious. The tasting room is open daily 11-5. Ferrari Carano is just down the road from Dutcher Crossing. It’s big, beautiful, and definitely worth a visit. The gardens, the view, and the winery are spectacular. The Ferrari-Carano tasting room is large and busy with activity. Take a walk down the stairs and catch a peek of the barrel room. All the wines are good here and we particularly like the whites. The Fume Blanc is a great value. The tasting room is open daily 10-5. Tours by appointment. For many years owner Ed Sbragia was the famed winemaker at Beringer Bros in the Napa Valley. When Beringer was purchased by conglomerate wine company he set out to have his own winery and label. In 2005 he established the Sbragia Family Vineyards. It is the very last winery on the Dry Creek Road heading from Healdsburg about ten miles from the 101 Exit on Dry Creek. The wines are delicious especially the lineup of Zinfandel wines. Perhaps the main attraction is the view of the Dry Creek Valley. It is the best of all the tasting rooms on this trail. The tasting room is open daily 11-5. Tours by appointment. Almost wineries in the Healdsburg charge a tasting fee. Expect to pay $10 or more to taste. Two people can always elect to share a tasting.